Christmas is just my very very favorite season. I love the lights, the snow, planning that perfect gift for a loved one, and the joy I feel from everyone around me. It truly is the most magical time of the year! 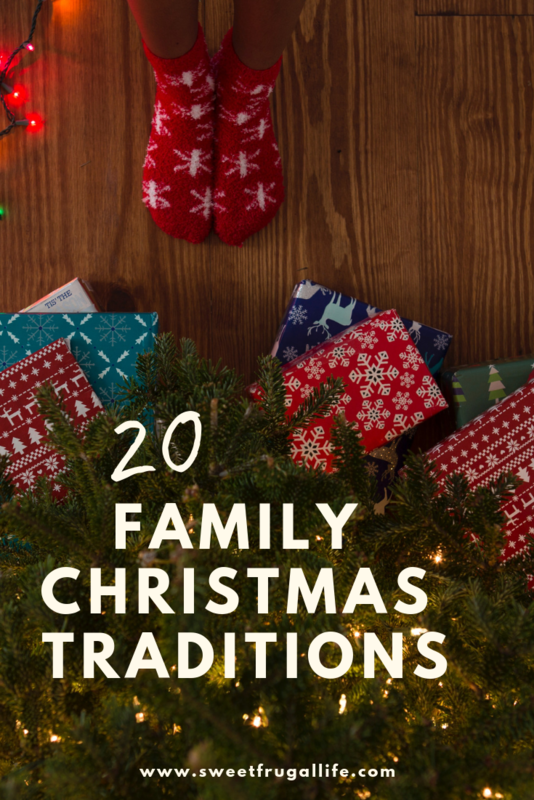 December is the perfect month for establishing family traditions. My hope is that one day my little family will look back on their childhood and remember the sweet memories and traditions we made together. You do not have to spend a lot of money to make these memories with your family. A lot of activities can be done completely FREE! 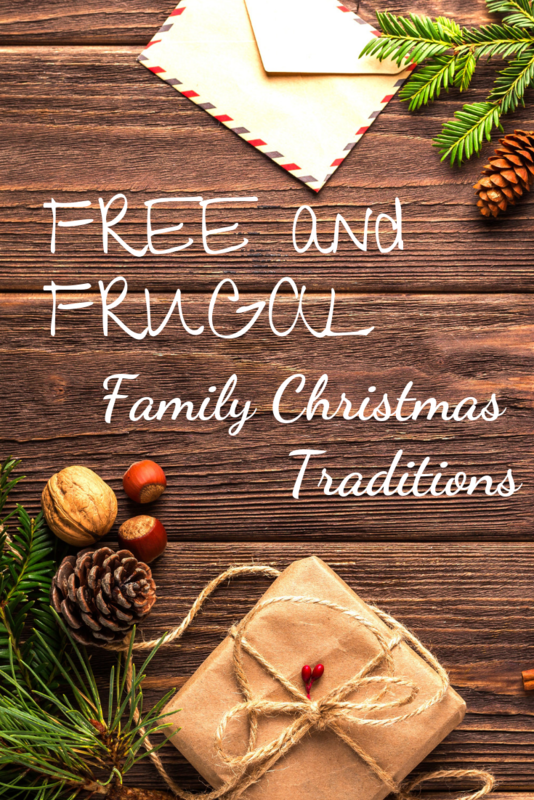 Here are 20 FREE or FRUGAL Family Christmas Traditions! Each year our family hikes through the forest to cut down our Christmas Tree. After finding that “perfect” tree we bring it home, turn on some Christmas music and spend a fun evening decorating it together. Our Christmas tree is decorated with salt dough ornaments, candy canes, and all the things that bring sentimentality and love to my life. The ornaments made by the hands of my sweet children are ones I will cherish forever! Every night for the entire month of December we turn off the lights in our house, sit in front of the lit up Christmas tree, and read a Christmas Story. Short stories can easily be found and printed from the internet, or you can usually find Christmas books at your local thrift store. I mean really, does it get any better than holiday baking?? I think NOT! With hundreds of different recipes and treats to choose from, we could be baking all month long! 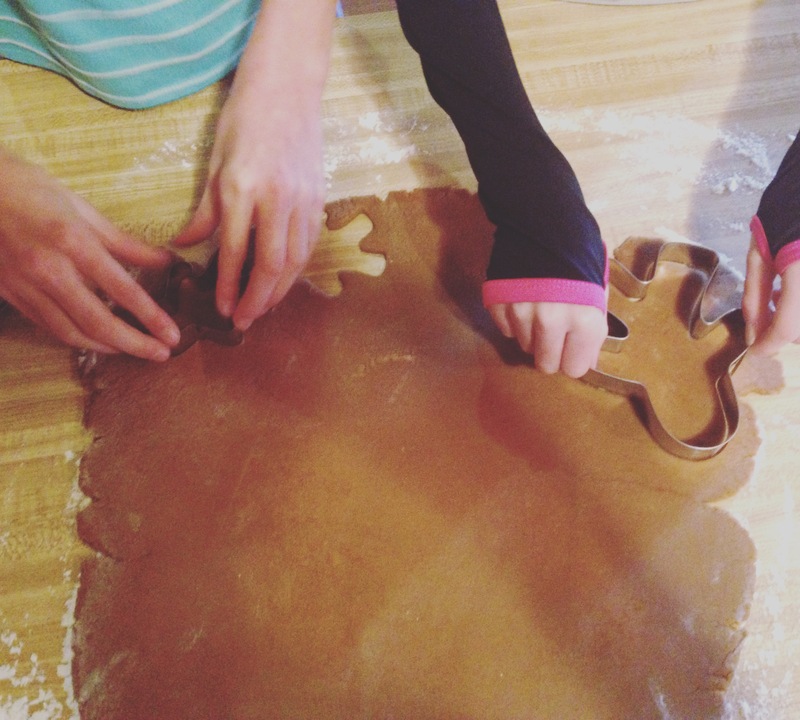 Holiday baking is a fun tradition to do with your kids. My kids love to help in the kitchen, ESPECIALLY if they know treats are involved! A few of our holiday favorites are gingerbread men, peanut brittle, pretzels dipped in chocolate, and homemade toffee. After all the holiday baking it’s so fun to deliver those yummy goodies to friends and neighbors. We like to get the kids involved in this. We package up the plates together, make cute little cards and spend an evening bringing some joy to our little neighborhood. I love this tradition and the way it brings a community together. Years ago I made a Christmas Advent calendar. It was quite a bit of work and honestly, there are so many cheaper and easier options out there. But, my kids love this calendar. It’s nothing fancy. They don’t receive a treat or activity each day, they just put a little felt ornament up on our felt Christmas Tree. When the tree is full, Christmas is here. It makes the long wait a little bit easier for the excited kids! Have a Christmas Movie night. I love snuggling up with my family and enjoying a feel good holiday movie. We enjoy classics like; It’s a Wonderful Life and White Christmas; or a newer family favorite is Elf. Netflix has a lot of great options, or check out a few from your local library. There are hundreds of darling Christmas Craft ideas all over Pinterest. I like to do a few of these during the school break with my kids. You can always find some ideas using items you already have in your house. 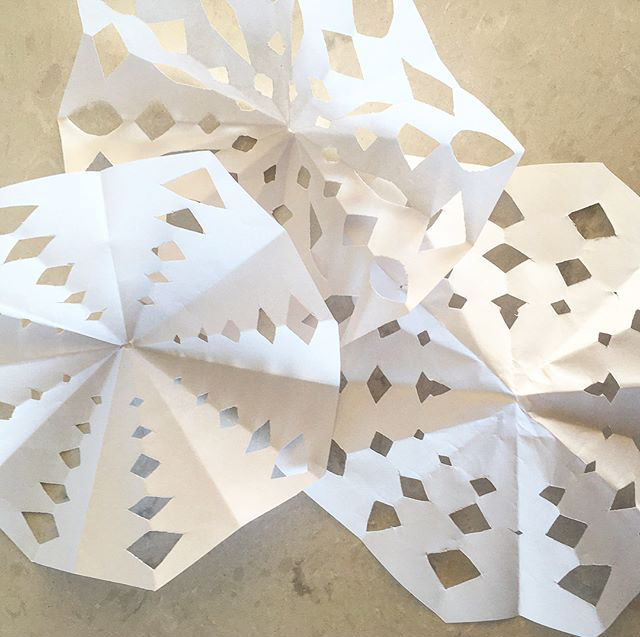 Cut out paper snowflakes and hang them around your house. You can find many tutorials on YouTube. These are usually easy enough for younger kids to enjoy. 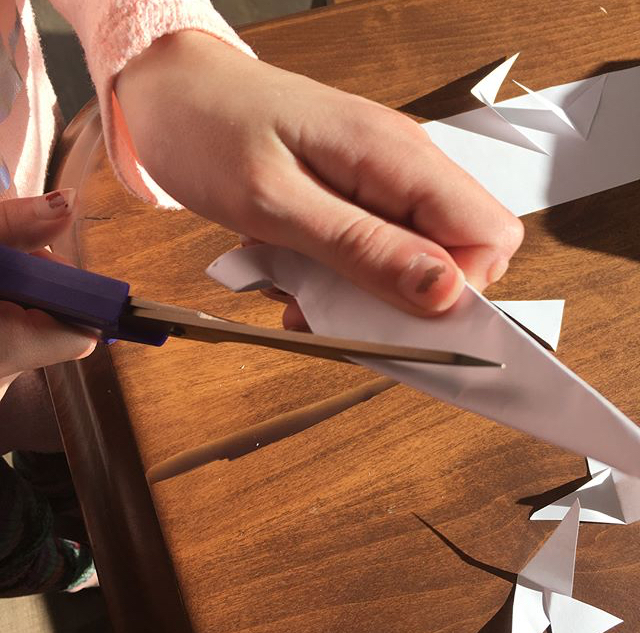 I will usually fold the paper for my preschool kids and then let them be in charge of cutting out the fun shapes. It’s such a joy to see every snowflake with a different unique design. I like to have a big fancy dinner with my family on Christmas Eve. When we have our big dinner on Christmas Eve, we are able to just relax and enjoy Christmas day stress free. We invite over extended family and everyone brings a side dish to share. When everyone helps contribute to the meal, it keeps the costs low. My kids like to write letters to Santa Clause every year. I am personally not a huge fan of the traditional letters to Santa, where the kids ask for all the things they want to be brought to them. Instead, I have my kids write to tell Santa about all of the good and nice things they have done throughout the year. I have told them this is how Santa decides if he will bring them a present or not. My hope is this will encourage them to focus more on being kind and less on materialist things. We have been participating in Light the World for the past few years. Light the World is a campaign sponsored by my church. It encourages families to look for ways to serve within their family, community and in the world. It is absolutely open to EVERYONE! The focus is less about religion, and more on service. There are so many different ways to serve and love others. Bake cookies for your local fire department, participate in Operation Shoe box, volunteer at a local soup kitchen, or become “Secret Santa” for a family in need. 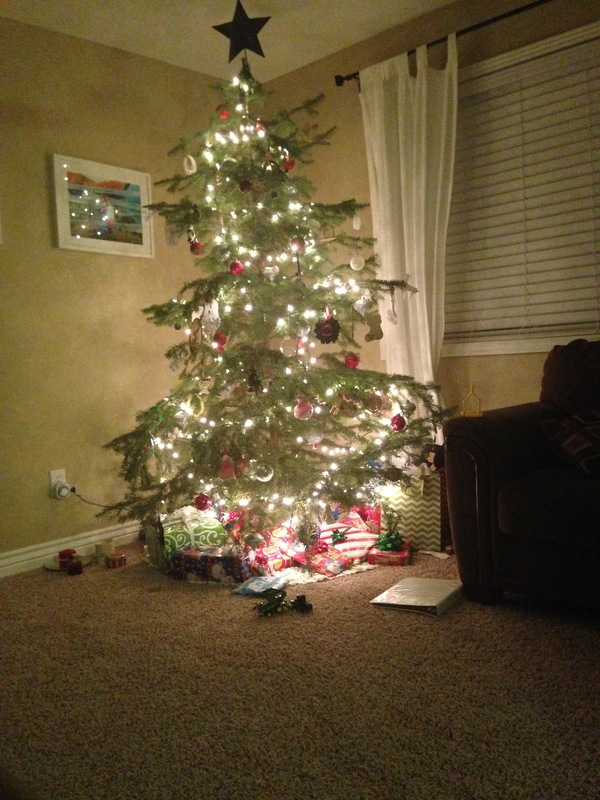 I love having my kids participate in this and have found it really brings the true spirit of Christmas into our home. Every Christmas Eve, after our special dinner, my kids act out the nativity as an adult reads the story out of Luke 2. The kids dress up as mary, joseph, donkey etc. I love this tradition! 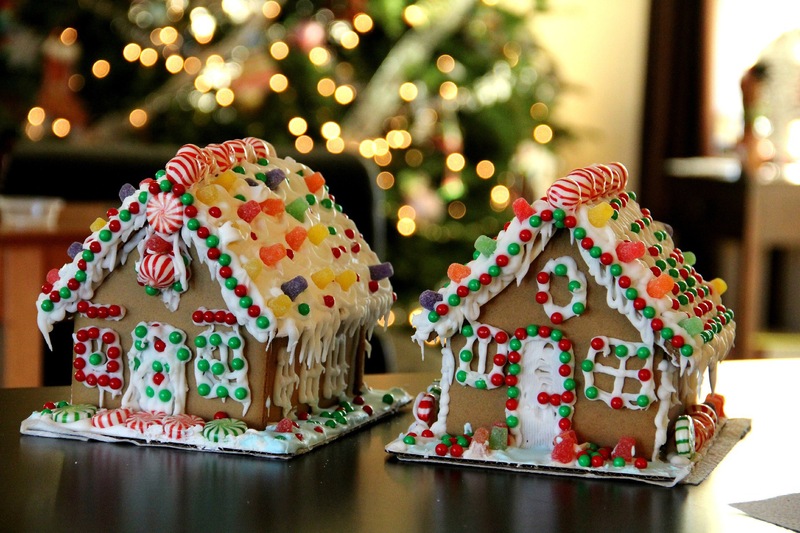 Spend an afternoon making a ginger bread house with your family. You can usually find fairly cheap kits at your local grocery store. One year we just used graham crackers and homemade frosting. For decorations we used items already in my pantry, like chocolate chips, marshmallows and almonds. It really doesn’t matter how fancy of a house you build, all that matters is that you’re spending time with your loved ones. Invite some friends over for an annual Christmas Cookie Exchange. Ask everyone to bring a dozen cookies and enjoy socializing and taste testing all of the different holiday cookies. You might even find a new favorite recipe! Ditch the traditional Christmas card and instead send out a Christmas e-mail. You can include a few pictures and a short update of what your family has been up to over the past year. I have even seen some free email card services you could look into! Host a White Elephant Party at your home. Ask everyone to bring a wrapped gift (something they already have around their house). Play a fun gift exchange game (these can be found on Pinterest) to decide who will open which present. This is a fun way to exchange gifts with friends, without having to spend a lot of money on everyone. It also brings a lot of laughs!! Set up a hot chocolate bar on Christmas Day. Keep it simple to prevent overspending. A few peppermint sticks, some marshmallows and whipped cream are all easy ideas. Search Pinterest for easy homemade hot chocolate mix. Look to your community for free Christmas Concerts and Events happening around town. Does your community put on a free nativity, light parade or other special concerts? You can usually find at least a few Christmas Concerts at the local high school. Set out milk and cookies for Santa Clause on Christmas Eve. Go one step further and make Reindeer Food. Mix together oats and glitter for magic reindeer food. Sprinkle it out in your yard to help the reindeer find your house. I am always searching for fun new traditions! What are some of your families favorite holiday traditions??? Let me know in the comments! Wow, I hadn’t thought about paper snowflakes in years! Such simple joys. The simple things always make me the most happy! 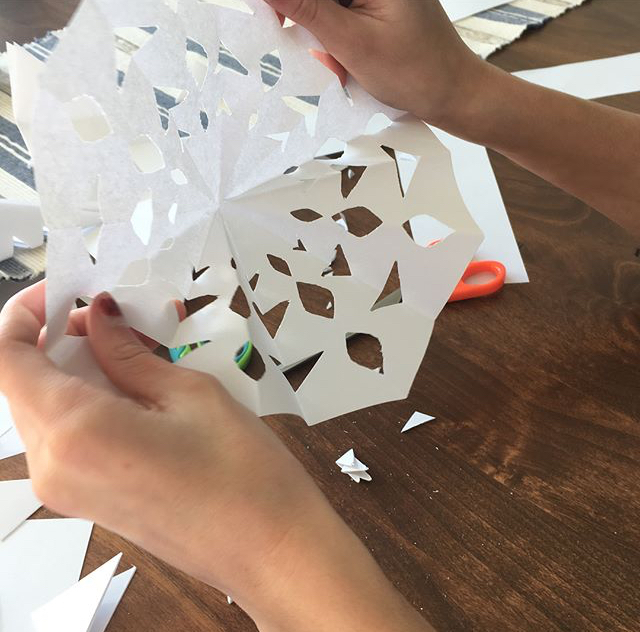 We have not made paper snowflakes yet this year, but we will have to do that! I love the festive look they add to the house! 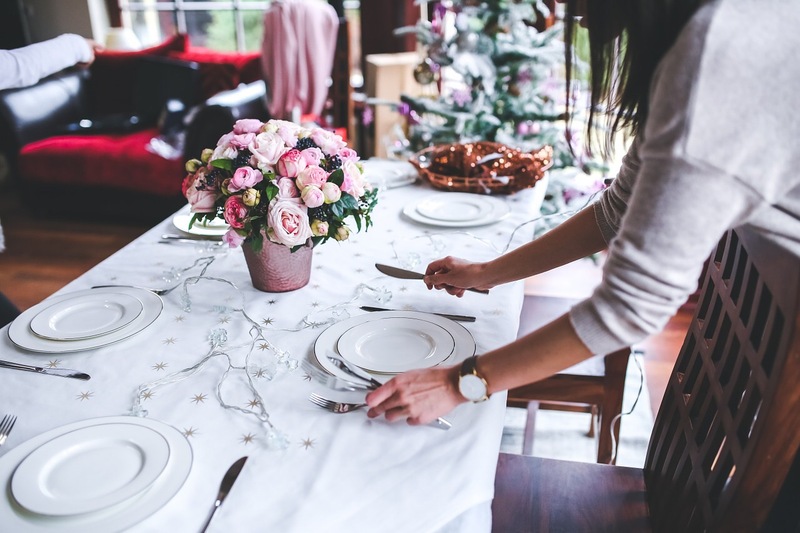 These are all great ways to celebrate the season without spending a lot of money! We love baking Christmas cookies, decorating the tree together, and making a gingerbread house every year. Gingerbread houses are so fun! Such sweet traditions! We love baking for neighbors during the holidays. So fun! I love making snowflakes. It’s so simple, but SO fun. I agree!!! The simple things always make me the most happy! !